Comedy and hilarity ensued at Storyhouse for the opening night of Mischief Theatre’s The Play That Goes Wrong. If you enjoy slapstick and physical comedy, then this is definitely a play you should watch. Heck, even if you’re not that fond of slapstick, you should watch it as you’ll find something to make you laugh. And laugh. And laugh some more. The wilds of a late January night (and build up of roadworks traffic along Wrexham Road) were not enough to dampen the spirits of those who were lucky enough to see Storyhouse‘s performance of The Play That Goes Wrong. From the talented minds of Mischief Theatre‘s Henry Lewis, Jonathan Sayer and Henry Shields come a highly physical comedy that is packed to the rafters with finely-tuned farce and Buster Keaton-inspired slapstick that is delivered with split-second timing and ambitious daring. The Play That Goes Wrong has earned no fewer than three critically acclaimed awards including the 2015 Olivier Awards for Best New Play and Best New Comedy and has now been licensed to 35 countries including China, Japan, France, and Australia, as well as making its long-awaited Broadway “da-boo” earlier this year (upon seeing The Play, you’ll understand). Yes, a comedy and one of the best darn ones to ever grace the stage at that, here in the heart of Chester, The Play That Goes Wrong captivated audiences all around the auditorium. Having not done any research into the storyline or plot of The Play beforehand – and doing the risky business of being accompanied by somebody who had already seen a previous performance – my mind entered fresh and without a preconceived notion of what I would like about it all. And a part of me is glad I did not have a prior experience with The Play, as I would constantly be comparing the two together, which is not necessarily a good place to be in. However, my partner was on hand to give her verdict throughout, and the results are in; Storyhouse’s rendition was funnier than the last time she saw it! I must concede that The Play was tremendously funny, from beginning to end. There’s so much seriousness in the world today, and even the ‘comedies’ aren’t necessarily all that funny from time-to-time. I can’t remember the last time I was rolling around my seat, laughing until my head hurt and throwing my head back in jubilation watching something. The Play did that to me last night though. As the play’s narrative tells, the Cornley Polytechnic Drama Society proudly present to you a murder mystery…unlike one you’ll ever find on the pages of Agatha Christie! The stage takes on a life of its own as everything that can go wrong, does! Stagehands work tirelessly to try and keep the performance running while the accident-prone thespians try their hardest to make it through to the end of the play. Inspector Carter aka Chris Bean (Jake Curran) leads the cast of the Cornley Polytechnic through their most recent performance to find the culprit responsible for the murder of Haversham Manor. Chaos and hilarity ensue as the actors and actresses suffer black-outs, technical malfunctions, forgotten lines, and (if you were in the room with us) impromptu pantomime – by the way, if that was supposed to be in there, sorry Mischief Theatre as most of us missed our cue! The play is as funny from the first scene as it is to the last, but my personal favourite moment came near the end of the first half where the traditional spit-take got seriously out of hand. As I mentioned earlier, it’s unusual these days where I find myself rolling around in my chair, almost breathless at the amount of laughter I’ve endured, but Mischief Theatre and the whole cast of The Play That Goes Wrong deserve every award they receive. If you manage to get some tickets, be sure to pay Storyhouse a visit as this is one of the greatest and funniest shows I’ve ever seen. And in a world where life is far too serious, it is comedies like this that help right a wrong and bring just the right sort of pick-me-up. You’ll be beating away those January blues in no time. 10/10 – Must See! Even if you’ve seen it before, treat yourself and have a laugh! You deserve it. Plus, it’s Child-friendly with no swearing or inappropriate content. 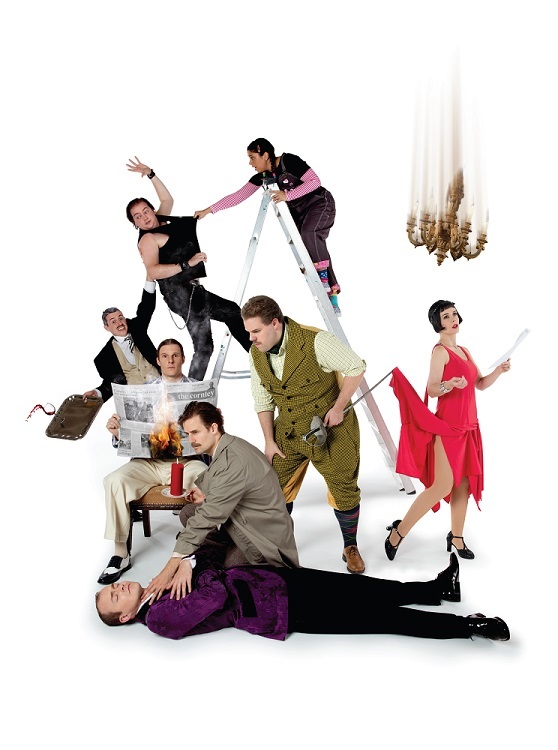 But be quick, as The Play That Goes Wrong is only around until Saturday 3rd February. Tickets are available at the Storyhousebooking website, with general information available as well here. The Play That Goes Wrong, starring Gabriel Paul, Catherine Dryden, Jake Curran, Steven Rostance, Kazeem Tosin Amore, Benjamin McMahon, Elena Valentine, Bobby Hirston, Liam Horrigan, David Kristopher-Brown, Louisa Sexton, and Laura White, on stage at Storyhouse in Chester from 29th January to 3rd February.